Republican U.S. Sen. Ted Cruz, left, and Democratic U.S. Rep. Beto O'Rourke, right, take part in their first debate for the Texas U.S. Senate in Dallas, Friday. U.S. Sen. Ted Cruz (left) and Democrat Beto O'Rourke. Friday’s focus was domestic policy, and the candidates sparred over everything from immigration, health care and gun control to their opinions on professional football players taking a knee during the national anthem. Cruz went out of his way to paint O’Rourke as to the left of House Minority Leader Nancy Pelosi and Sen. Bernie Sanders, someone “out of step with the people of Texas” who wants to abolish Immigration and Customs Enforcement, take away Texans’ guns, and impeach President Trump. “We’re seeing nationally socialists like Bernie Sanders, like Alexandria Ocasio-Cortez and, indeed, Congressman Beto O’Rourke advocating for those same policies,” Cruz said. O’Rourke, an El Paso Congressman, accused Cruz of caring more about tax cuts for corporations than his constituents, saying he wanted “to deport each and every single Dreamer," and criticizing him for being an absentee senator who spent more time campaigning in Iowa than Texas. The surprisingly competitive Senate race has become one of the most watched and talked-about contest of the 2018 midterms. Once considered a safe seat for Cruz, recent polls show the candidates running within single digits of each other. Just this week, the Cook Political Report reclassified the race, calling it a tossup. That’s a big deal in Texas, which hasn’t elected a Democrat to statewide office since 1994. And it's a big deal nationally too: Democrats are likely to retake control of the House in November. If O'Rourke and other candidates in close races win, they could wrest control of the Senate from Republicans too. Cruz said he could sum up his position in four words: “Legal: Good. Illegal: Bad." O’Rourke chided Cruz for supporting legislation that would have allocated billions of dollars to build a wall along the U.S.-Mexico border, and called for an earned path to citizenship. 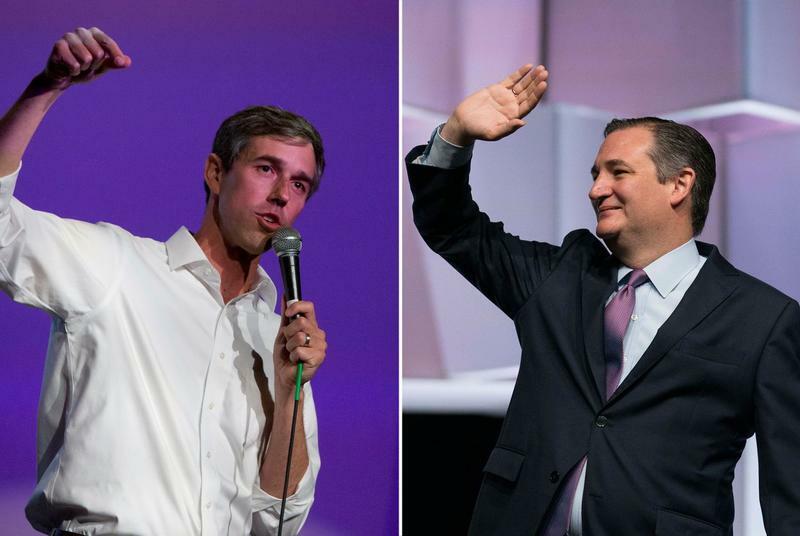 The crowd watching the debate at Southern Methodist University Friday was most animated while Cruz and O’Rourke took on guns, police violence and mass shootings. A question about the shooting of 26-year-old Botham Jean pivoted into Cruz chastising O'Rourke for calling for the officer’s firing, using hateful rhetoric and "turning people against the police." He raised the specter of the 2016 ambush killing of five Dallas officers by a troubled Army veteran, reportedly upset by stories of police brutaily. Cruz said O’Rourke wanted to get rid of the Second Amendment, prompting O’Rourke to say that wasn’t the case. O’Rourke talked about learning to shoot as a kid, but also said it’s time for universal background checks and a ban on assault weapons. Texas has been in the headlines for two high-profile mass shootings over the past year — one in November 2017 at a church in Sutherland Springs and another in May at Santa Fe High School, outside of Houston. Cruz recalled meeting with students and teachers from the school. O’Rourke mentioned a conversation he had with the mother of a Santa Fe victim. He said she told him that bringing guns into classrooms wouldn't have saved her daughter's life. “Thoughts and prayers, Senator Cruz, are just not going to cut it anymore. ... The children of Texas deserve action,” O’Rourke said. The debate was testy through the last question of the night. Candidates were asked about what they admired about their opponent. Cruz compared O’Rourke to socialist Sen. Bernie Sanders of Vermont. KERA's Bill Zeeble, Christopher Connelly, Anthony Cave and Molly Evans contributed to this report. 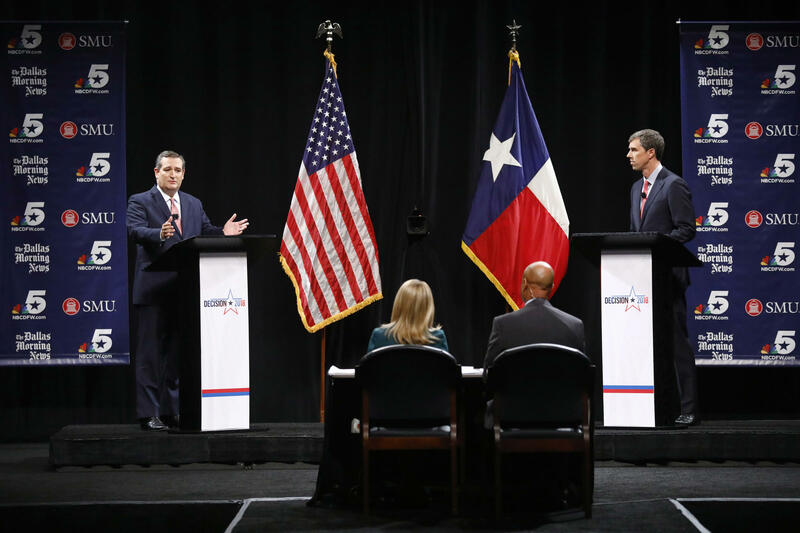 Cruz and O'Rourke will face off again Sept. 30 in Houston and Oct. 16 in San Antonio. Election Day is Nov. 6. The deadline to register to vote is Oct. 9.